In English Grammar, Voice is used to decide whether the verb is working actively or passively in a sentence. In this way, there are two broad classifications of voice, i.e. active voice and passive voice. If in a sentence, the subject acts as the doer of the action, then it is called as an active voice. Active: Maria followed the thief. Passive: The thief was followed by Maria. Active: She told me the truth. Passive: The truth was told to me by Maria. In the given examples, you might have noticed, that when the sentence is in the active voice, the focus is on the subject, but when we converted the sentence to passive voice, the focus is shifted to the action. Meaning Active Voice refers to that type of voice, wherein the subject carries out the action designated by the verb. Passive Voice is a kind of voice, wherein the subject acts as the recipient of the action. Position As the subject is responsible for the action, it appears at the first place. Object on which the action is performed, appears as the first place, while the actor appears at the end. Example I am playing cricket. Cricket is being played by me. She sent an email to the Human Resource Manager. An email was sent by her to the Human Resource Manager. Let me put it there. Let it be put there by me. 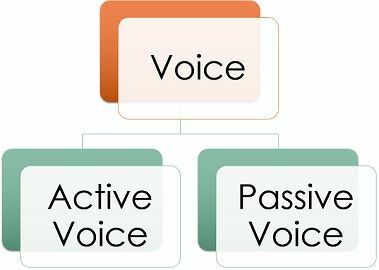 Active Voice can be understood as the form of writing which depicts when the subject is carrying out the action indicated by the verb and takes the object directly. The subject is the person or thing which we are talking about, and the object is the person or thing to which the given action is targeted. The policeman encountered the criminal. Children are making a painting for a school exhibition. I was cooking food last night. Passive Voice refers to the style of writing, which we use when instead of emphasizing the subject we put stress on the action, i.e. the verb and the object thereon. The criminal was encountered by the policeman. Painting is being made by the children for school exhibition. Food was being cooked by me, last night. Let it be done by me. When in a sentence, it is the subject which performs or completes the action, it is called as active voice. On the contrary, when in a sentence, the action is received by the subject, then it is called as a passive voice. In an active voice, it is the subject which acts upon the verb, whereas in the passive voice, the subject is being acted upon by the verb. In an active voice, as the actor is the subject himself, who is responsible for the concerned action, it appears at the first place. As against, in a passive voice, the person or thing, on which the action takes place, appears at the first place, while the actor comes at the end, indicated with the preposition ‘by’. I play football. Football is played by me. I am playing football. Football is being played by me. I have played football. Football has been played by me. I played football. Football was played by me. I was playing football. Football was being played by me. I had played football. Football had been played by me. I will play football. Football will be played by me. I will have played football. Football will have been played by me. Active: Her parents helped her in completing the project on time. Passive: She was helped by her parents, in completing the project on time. Active: I am learning English from an expert. Passive: English is being learnt by me, from an expert. Active: They handed over me the basket full of fruits. Passive: The basket full of fruits, was handed over to me by them. Active: John is buying a new laptop. Passive: A new laptop is being bought by John. In general, we mainly use the active voice, for writing purposes, to make the sentence more simple, direct and easy to understand. On the other hand, passive voice is mainly used in legal writing and for stylistic writing.